What becomes important is how Fitzgerald frames the decision to leave the state as a vacation and a refusal to work to attack the character of these Wisconsin Democrats. In a similar sense during the height of the demonstrations at the Capitol, one pro-Walker protestor created a sign that read “We Protest on SATURDAYS. Too Busy Working M-F Paying for Union Greed.” Instead of getting into the nuances, finances and specifics of Act 10, it is this framing of the protestors, of the Democrats, of unions and of the morality of work that is worth further examination. One of Scott Walker’s first official slogans as governor was “Wisconsin: Open for Business” and this clearly echoes Fitzgerald’s statement and the anonymous sign wielding protestor as they cast American society as one in which “work” represents one’s moral obligation. Such a reading of work frames the thousands of Wisconsin public school teachers who called in sick and the hundreds of other union members who ditched work and bussed in to Madison at the height of the protests as immoral, government leaching parasites. For Fitzgerald et al., rather than taking a day off of work to exercise their right to free speech, the tens of thousands of workers who showed up on those cold Winter days should instead have been sitting at their desk or bent over a soldering iron, continuing their routine work and pretending that Scott Walker was not seeking to tear apart their right to collectively bargain. We must remember these teachers, these steel workers and these politicians for questioning the very morality of work. Instead, of being criticized, they ought to be honored for doing the exact opposite of what the Republicans wanted them to do: refusing to work during a time of dispute. They ought to be honored for questioning politicians, bosses, managers, and workplace conditions. Honored for standing up to a governor and a false moral obligation that sought to reduce their benefits, their wages, their hours and their bargaining rights in order to turn a profit. And of course, we must also remember the rich history of the countless workers who have organized together throughout history. From fast food workers all across the country who took to the streets last week demanding a livable wage, to the more “radical” members of Haymarket Affair who fought for an 8 hour workday in Chicago in 1886, labor has and must continue to fight. And as it fights, labor must be willing to take on those who seek to portray work as a moral obligation that is immune to criticism, questioning and the occasional rabble-rousing strike or work stoppage. David Graeber one of the most famous members of Occupy Wall Street’s earliest days (which of course, was a movement inspired by the successes of demonstrations in Madison) says of work and its effect on its laborers, “politically, there is no better way to ensure people are not politically active or aware than to have them working, commuting to work, or preparing for work every moment of the day. Sacrificing so many of one’s waking hours to the gods of productivity ensures no one has access to outside perspectives that would enable them to notice- for instance- that organizing life this way ultimately decreases productivity.” Certainly Graeber is not suggesting that work is somehow a giant conspiracy used by the ruling elite to “rule over” the ignorant masses. But Wisconsin and Graeber remind us that we ought to question. We ought to fight. We ought to reject the imagination-crushing mundaneness of routine work and be aware of plots like Act 10 that seek to reduce tangible human benefits in order to turn a profit and make Wisconsin: More Open for Business. Graeber, David. 2011. Revolutions in Reverse: Essays on Politics, Violence, Art, and Imagination. Autonomedia. Brooklyn, NY. 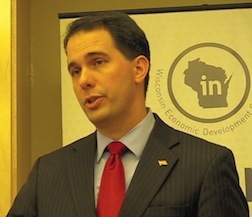 Keep your noses to the grindstone, folks, while Walker jets around the state, nation and world on either the public’s dime or money from wealthy benefactors seeking to keep more of the money they extort from workers. That really hits the nail on the head.